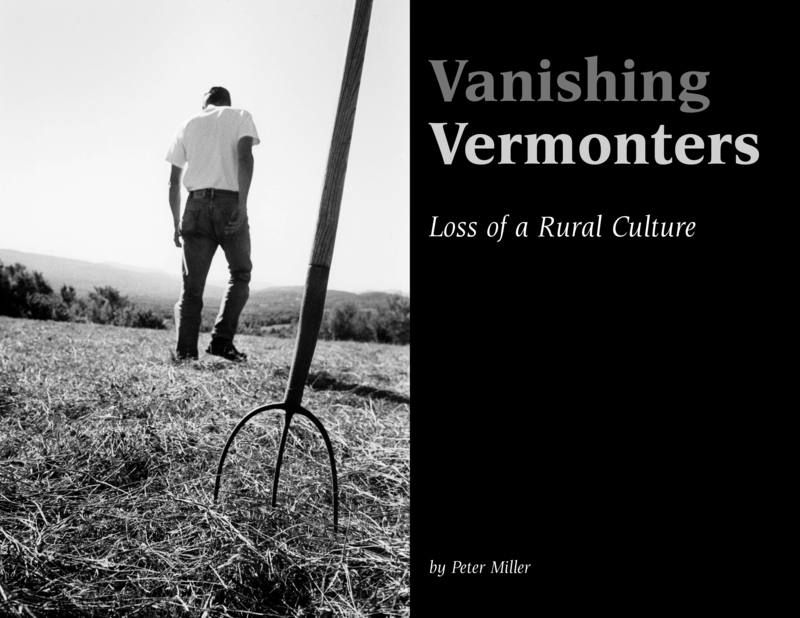 I wrote a commentary for Vermont Digger— I am Vermont Broke (August 21, 2016) and I received so many comments I wrote the book titled Vanishing Vermonters, Loss of a Rural Culture. 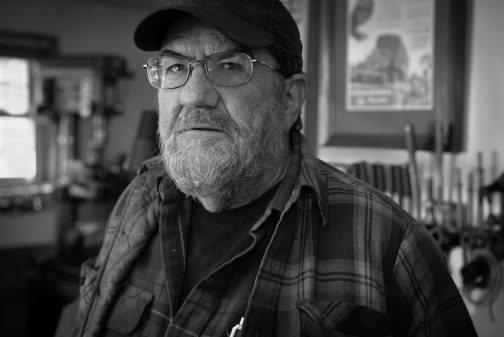 My thrust was to interview Vermonters (24 of them), who live in small Vermont communities and, in a short profile illustrated with a portrait, identify in words who they are, what they do, and what their life and hope is. I then recorded their words—“ What do you like or not like about Vermont and how is it affecting your life?” I also included other photos that were a document of our culture as it twists its way to the future. Took a while to figure out how to research and write for I was doing two stories in one—a profile on the subject and a digitally recorded interview. It took much mulling about in my muddied mind to translate it so a person’s character became a portrait of our time. In the fall of 2016 pneumonia dropped in to say HI! and burrowed into my chest. One doctor told me I might not survive six months. “Jeezum Crow,” I said, “I have a lot of work to finish!” Then this hospital found out my pacemaker was dying and if I died in their bailiwick they could be sued for malpractice. So they shipped me back to Burlington where my coronary doctor hung out. Good. I went there and a young Indian doctor listened to my heart and said, “What’s this? What’s this! You’re not going to die, and ran off to get the coronary doctor. I have A-Fib and I had a heart attack but what they were concerned with was my tin heart. The shroud around my heart had calcified and when I exercised the heart couldn’t expand and I ran out of breath. My cardiologist told me that I had that ‘tin heart” for ten years so what else is new and I would have it for a number of years. sa book to do, $500 to my At the time I had the book to complete, $500 in the bank, and pneumonia fooling with a tin man’s heart. Not good. My daughters kicked in and sent me to live in a small apartment in Florida. Sun, warmth, sea level oxygen, no snow to shovel—I regained my health in a month and spent two and a half months writing Vanishing. 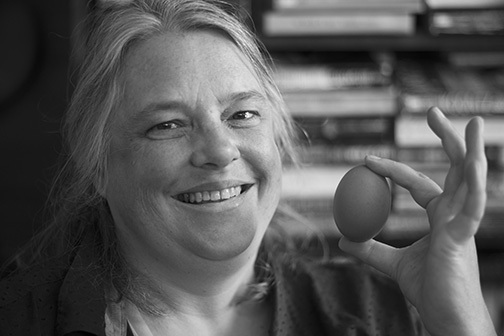 In April I returned to Vermont, set up a Kickstarter campaign that raised enough money to publish the book. Wanted to print the book in Vermont to make it home-grown. When I returned to Vermont, I took off three days and then began a harrowing experience with the printer. They did not know how to print a fine art book with duo tone black and white photographs. I showed then how—11 days I sat down with their tech man. He learned. Then, after I set the price for the book based on my bid and notified the book stores, the printer sent me a large bill for the time I taught their techie and add-ons that were never approved or signed off on. Then they said I could not pick up any books until the new charges were paid, although I had paid the original cost for printing. I had to retain a lawyer to change their train of thought. All that led me to say never again would I have a fine art duotone book printed in Vermont or America. Too expensive or too shoddy and sometimes both, The Italians do superb work at fair prices. So do the Chinese, if you have a printing expert, or yourself, looking over their shoulder. Enough! Now to the future and what I learned after self publishing five coffee tables books. The printing and binding prices for a fine art book with duotone have escalated to the point where a small regional publisher can barely survive. I had wound myself into a messy ball, as a photographer and writer who never wanted to be a publisher but yearned for perfection in my books. I stopped full stride, stamped my feet, did an about face and went straight back to where I came from…photography. I don’t want to spend hours wrestling with a sentence or paragraph, sitting for days in front of a computer, taping interviews or doing heavy research and dealing with printers. No. I want to be outside; I sit for hours watching the light change. Sometimes I don’t take a photograph but return when the wind and sun and sky tells me to. Other times I am looking at the map of a person’s face and translate onto an image what their face and surroundings say about the life they live. 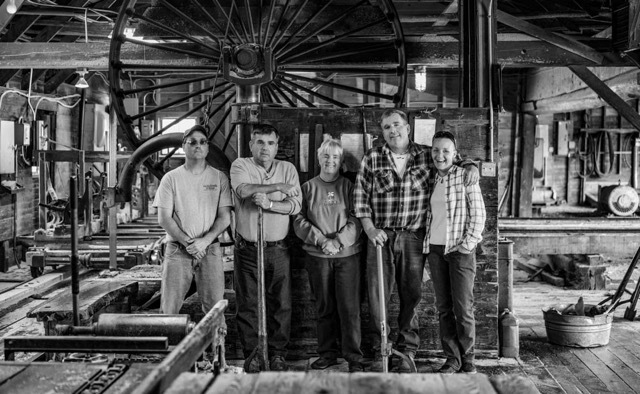 Heath family and their Phoenix Band Saw, about 150 years old. So back to the camera and the purity of taking a picture that gives me goose bumps. Yes I specialize in black and white and yes I love black and white as a way to go inward into a person’s psyche and to weave in the surroundings my people exist in. Here I am. I have given up books. I sold my Airstream and re-designed my gallery and hung large prints in black and white and a few silver gelatins made by me in my darkroom, which I still have. Raised my prices too. Have I gone retro? You bet! I have a Rollei and Leica like I used in Europe 62 years ago. Maybe you could call me a half breed. 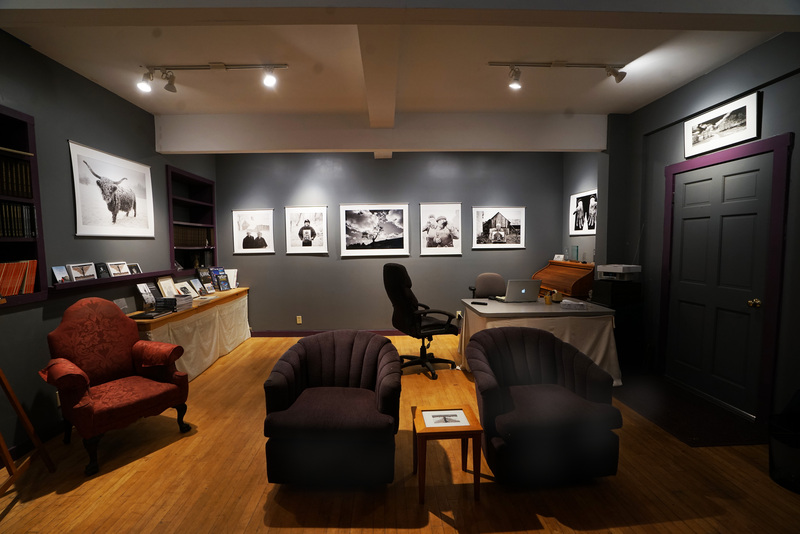 I have film and digital cameras and a 55 inch monitor on the wall in the gallery to display my archive. When I am trapped by a deadline, I use digital. When I have the time, it is film. I’m AC-DC that way although I lean towards the hand-crafted print, either processed by me in the darkroom or created digitally by my alter ego, in this case Ward Rice, my printer who has a studio in Stowe, Vermont. So the last bridge is burned. Forward! The new Gallery in Colbyville. Monitor is facing chairs. No matter what is happening in your life, Peter, you are always a fascinating inspiration. I’m so happy you’re back to taking photos because that’s what you want to do. Thank you for all the gifts you have given us in your books and photos. Wishing you many happy photographic hours. Very truly yours. Thanks for the good wishes, Susanne. Photography is so much more enoyable, to me, then the extreme focus and direction writing takes. Anyway, I have new ideas for photos and techniques! I hope all is well with you and your husband. Come visit! I’m glad that you are back to what you love to do Peter!